Dr Guillermo Gonzalez is an astrophysicist and assistant professor of physics and astronomy at Iowa State University [ISU], as well as a senior fellow of the Discovery Institute’s Centre for Science and Culture, considered the hub of the Intelligent Design [ID] movement. Earlier this year, ISU President Gregory Geoffroy notified Gonzalez that he would not be granted tenure and promotion to associate professor. Notice that the above statement does not give the reason the faculty came to its decision to deny Dr Gonzalez tenure. His academic qualifications for the position would appear to far exceed the requirements. M31, the andromeda galaxy, 2.5 million light years from earth. He has received fellowships, grants and awards from NASA, the University of Washington, Sigma Xi (scientific research society), and the National Science Foundation. He has been at ISU since 2001. He has published 68 articles in peer-reviewed journals, including Astronomy and Astrophysics, Monthly Notices of the Royal Astronomical Society, Astrophysical Journal, and Solar Physics. Dr Gonzalez’s international reputation is surely established by his post-doctoral work described above; and his 68 peer-reviewed journal articles (of which 21 have been while he was at ISU) exceed the 15 required by ISU by 350 per cent! ‘[D]ata from a prestigious Smithsonian/NASA astrophysics database show that Gonzalez has the highest rating for citations to his work of anyone in his department: “Mr. Gonzalez has a normalized h-index of 13, the highest of the 10 astronomers in his department. The next closest was Lee Anne Willson, a university professor who had a normalized h-index of 9.” The fact that Gonzalez—an Assistant Professor—is ranked higher than any other member of his department, including full professors like Willson, is incredible. ‘I went to the Web of Science citation index which is the authority on citations. Only journal papers, not conference papers, are indexed. There are lots of Prof. Gonzalez’s papers listed. My jaw dropped when I saw one of his papers has 153 citations and 139 on another. I have sat on oodles of tenure committees at both a large private university and a state research university, chaired the university tenure committee, and have seen more tenure cases than the Pope has Cardinals. This is a LOT of citations for an assistant professor up for tenure. The number of citations varies with discipline and autocitations are included in the tally, but this is a LOT of citations for an Assistant Professor. A lot. Tenure statistics show that 91 per cent of faculty who applied for tenure this year at ISU received it, refuting the university’s claim that its tenure standards are ‘so high, that many good researchers have failed to satisfy the demands of earning tenure’ at ISU. Dr Gonzalez’s research has focused on examining stars with planets to see what sorts of properties they exhibited. It has led to the discovery of two new extra-solar planets. His research team discovered what is known as the Galactic Habitable Zone (GHZ), a term Dr. Gonzalez coined. His work has lead to feature stories in Science and Nature, two of the world’s premiere scientific publications. 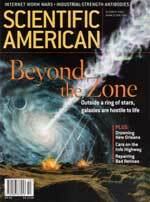 And he and his associates wrote a cover story about GHZ in the October 2001 issue of Scientific American (pictured). He is also the co-author of the second edition of Observational Astronomy, an advanced college astronomy textbook published by Cambridge University Press, and he is co-author of the 444-page book The Privileged Planet: How Our Place in the Cosmos is Designed for Discovery. Dr Gonzalez has refrained from mentioning his religious beliefs in his teaching and peer-reviewed works, but his 2004 book The Privileged Planet: How Our Place in the Cosmos is Designed for Discovery, co-authored with Jay Richards of the Discovery Institute, includes many of his pro-design arguments. What then is the reason for denial of tenure to Dr Gonzalez? An interesting clue is that it appears that ISU, at the same time as it denied tenure to Dr Gonzalez, decided to promote to full professor outspoken atheist and secular humanist Hector Avalos, professor of religious studies, faculty adviser to the ISU Atheist and Agnostic Society, and editor of the Journal for the Critical Study of Religion. ‘In the first phase what I hope will be deleted is any endorsement of violence that cannot be proven by scientific means to be coming from God. In the final phase, we hope to persuade humanity that the entire Bible should be removed as an authority in the modern world. From 2001–2004, Dr. Gonzalez was a Co-Investigator on a NASA Astrobiology Institute grant for ‘Habitable Planets and the Evolution of Biological Complexity’ (his part of the grant for this time period was $64,000). From 2000–2003, Dr. Gonzalez received a $58,000 grant from the Templeton Foundation. This grant was awarded as part of a competitive, peer-reviewed grant process, and his winning grant proposal had been peer-reviewed by a number of distinguished astronomers and scientists. Earlier in 2007, Dr. Gonzalez was awarded a 5-year research grant for his work in observational astronomy from Discovery Institute (worth $50,000). Such an assault on academic freedom does not bode well for the advancement of true science. It should be noted that many in the ID movement do not hold to the biblical history of the universe as laid out in Genesis—we are unaware what Dr Gonzalez believes about creation. However, even the mere suggestion that someone believes that the universe shows signs of design appears to be enough to cause this sort of persecution. Those who control academia are at war with God and will not allow the concept of design to be discussed. It seems that no matter how much evidence for design is presented by ID advocates, both the evidence and the person(s) advocating it will be booted out. The common argument raised by anticreationists, that ‘if your ideas were sound, they would be accepted by the scientific establishment, so why don’t you get them published there’, is seen to be laughable. The fond notion that science is some sort of self-correcting, ideologically neutral pursuit of the truth, wherever it might lead, is seriously undermined by these happenings. This should alarm not only Christians, but advocates of academic freedom in general. Update: see this off-site rebuttal to evolutionary attacks on Dr Guillermo Gonzalez. Iowa State University News Service, May 14, 2007. http://www.iastate.edu/~nscentral/news/2007/may/tenureFAQ.shtml May 23, 2007. Return to Text. Brumfiel, G., Darwin sceptic says views cost tenure, Nature 447(7143):364, 24 May 2007. Return to Text. Given in ref. 2 as ‘Gonzalez, G., Mon. Nat. R. Astron. Soc. 285, 403–412 (1997)’ and ‘Gonzalez, G., Astron, Astrophys. 334, 221–238 (1998)’. Return to Text. For a full list of these see http://www.discovery.org/scripts/viewDB/filesDB-download.php? command=download&id=1362 May 23, 2007. Return to Text. http://www.evolutionnews.org/isudeptphysastron.pdf May 23, 2007. Return to Text. educatione.html#more May 23. 2007. Return to Text. expresses_as.html May 23, 2007. Return to Text. Avalos, H., Society of Biblical Literature forum, http://www.sbl-site.org/Article.aspx?ArticleId=520 May 24, 2007. Return to Text. Ledford, H., Scriptural violence can foster aggression, Nature 446(7132):114–115, 8 March 2007. Return to Text. -the-bible/ May 24, 2007. Return to Text. atheist_pr.html#more May 23, 2007. Return to Text. faculty_acknowl.html#more May 24, 2007. Return to Text. &dept_id=554432&brd=2700&pag=461 June 6, 2007. Return to Text. _%28astronomer%29#Tenure_Controversy June 6, 2007. Return to Text. _research_grant.html#more June 6, 2007. Return to Text. senator_expre.html#more May 24, 2007. Return to Text.